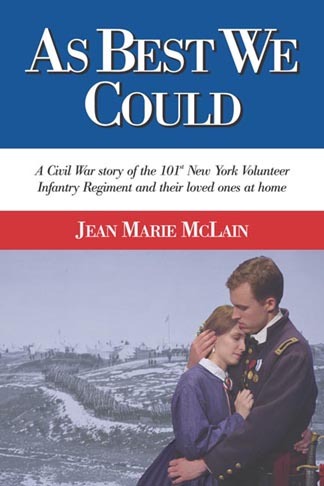 Just before Christmas, 1861, James “Jamie” McNeil, a young recruit in Captain Buckham’s Sharpshooter Company at Delhi, New York, writes a letter of apology to pretty Mary Edwards. Mary had tumbled off her horse, and Jamie hopes she will forgive him for causing the accident. Mary, a spirited young woman from a farm near Meredith Square, replies pertly that she cannot accept his apology for, she admits, the mishap was entirely the fault of her own Willful Nature. She had been scandalously riding astride, and in scrambling to adjust herself properly sidesaddle, had lost her balance and fallen. “As Grandmother would say, I am a foolish girl who got what was coming to me,” she tells him. Jamie gallantly replies that she should not believe she deserved what she got, and that her fall was really very graceful. So begins a correspondence that is to last through nearly four years of war and suffering, and will blossom into a love that will sustain each of them in their most trying days. Click here to read Jamie's Gettysburg Letter to Mary. The author brings the years of the United States Civil War to life as you've never experienced them before. Using letters sent between soldiers fighting in the war and loved ones waiting at home, she describes, in a clear and compelling way, their thoughts and feelings as they live through the most horrendous war America has ever experienced. You will fall in love with Mary and Jamie as they slowly discover each other and a love that will last a lifetime. Jean Marie has written a sequel to As Best We Could. The sequel is called, A Light in the Window. Click this title to learn more about it. Buy both As Best We Could and A Light in the Window together for a discounted price.